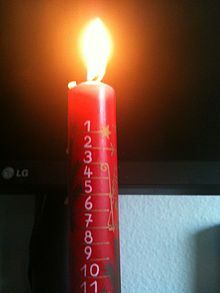 We’ve said that Advent marks a time of waiting. But what are we waiting for? Well, that would depend on who you ask. Most people would say that we are waiting for Christmas. For a large part of our world around us, advent is just the bit before Christmas when you do your shopping. But clearly that has little or nothing to do with waiting. We are waiting, looking forward to the celebration of Christmas – remembering the first Christmas was the most extravagantly gracious and outrageously wonderful thing that has ever happened in the universe, the moment that the eternal God came to live with us, as one of us, sharing our humanity in every way, so that we could share our lives with Him. This is certainly worth celebrating; it is a story worth any number of tellings and retellings. But the purpose of the season of Advent when it comes around every year is to remind us that we are not just waiting to celebrate a wonderful event that happened two thousand years ago and is over and done. We are waiting because there is something more. We are waiting for the conclusion of the story that began on that night in Bethlehem when a carpenter and his pregnant wife searched for a room to stay in. And Advent reminds us that we are waiting for something that is certainly going to happen, and might even happen today or tomorrow or the next day. Jesus was born into this world to bring light and healing. He was born into the world to bring real life, not to tell us about an afterlife. So we, as Christians are also to be bringers of the kingdom to this earth everyday; to live lives of grace and forgiveness and kindness and compassion as Jesus did. We are called the Body of Christ because we are his hands and feet and eyes and ears in this world. Because his Spirit lives in us, through us his kingdom comes and his will is done on earth as it is in heaven. We are all very imperfect raw materials, but in the hands of the great Carpenter we are his excellent workmanship, and by his grace our lives do show forth his goodness. And so the kingdom of God has already broken in upon this world. Just like the small, bright flame of an advent candle or the candles of the advent wreath we light each week, Advent shines the light of hope into our world. We of all people in this world can face the reality of things gone wrong in our world, and of suffering without despair, because we know that the true Light has shined into our darkness and that the darkness could not overcome him.